The Rolling Stones London Roundhouse (TMQ 71029) LP greenSwirledWax !nShr!nk!! Super rare - not many of these do exist! WHAT YOU SEE IS WHAT YOU GET- SATISFACTION GUARANTEED! Shipping abroad by registered airmail or insured parcel (depending on value). MINT (M): The record itself is in brand new condition with no surface marks or deterioration in sound quality. The cover and any extra items such as the lyric sheet, booklet or poster are in perfect condition. Records advertised as Sealed or Unplayed should be Mint. 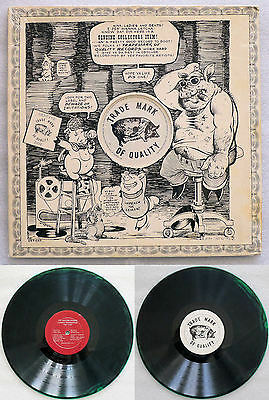 EXCELLENT (EX): The record shows some signs of having been played, but there is very little lessening in sound quality. The cover and packaging might have slight wear and / or creasing. VERY GOOD (VG): The record has been obviously played many times, but displays no major deterioration in sound quality, despite noticeable surface marks and occasional light scratches. Normal wear and tear on the cover or extra items, without any major defects, is acceptable. GOOD (G): The record has been played so much that the sound quality has noticeably deteriorated, perhaps with some distortion and mild scratches. The cover and contents suffer from folding, scuffing of edges, spine splits, discolouration, etc. FAIR (F): The record is still just playable but has not been cared for properly and displays considerable surface noise; it may even jump. The cover and contents will be torn, stained and / or defaced. POOR (P): The record will not play properly due to scratches, bad surface noise, etc. The cover and contents will be badly damaged or partly missing. As well as the above grades, NEAR MINT (NM) is often used as well; this is really for a record that appears new but is known to have been played because the label has light spindle marks or because it has come from a previous owner and is assumed to have been played by them. For records which appear to fall between the accepted grades, + and - are also often added to the grading.